Corrosion Resistance: Fiberglass composites are an excellent material to withstand a wide spectrum of service environments. Resins and material matrixes are designed for each application, thus reducing corrosion and extending the service life of the vessel. A sampling of chemicals that are suited for fiberglass storage are: Sodium hypochlorite, sodium hydroxide, hydrochloric acid, hydrofluorosilicic acid, phosphoric acid, sulphuric acid, glycals, urea, ferric chloride, ferric sulfate, ammonium hydroxide, brine, UAN, and starter fertilizers. Fiberglass is also a superior material choice for many air pollution control scrubbers, such as NOx emissions reduction equipment. Value: A benefit of fiberglass tanks is their extended service life. Though mild steel is often initially less expensive, over the life span of the vessel, fiberglass is much less expensive. The exterior of GPI tanks is gel-coated and includes a UV inhibitor, which means you will never have to sandblast or repaint our vessel. If damage does occur to the vessel, fiberglass is an easily repairable. Also, the initial cost of fiberglass is less than stainless steel and other exotic metals. Mechanical Properties: Fiberglass is a robust material that can withstand corrosion, is stronger and lighter than steel, and is easily repairable. But unlike metals, fiberglass can easily be molded to form complex geometries and curved surfaces. Unlike standard polyethylene tanks, custom fiberglass tanks can be tailored in endless ways to accommodate fittings and accessories, including larger diameters and volumes. Fiberglass can also be designed to withstand high temperatures and abrasive materials. 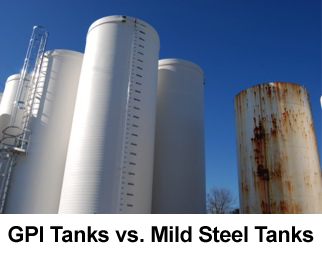 Fiberglass tanks can withstand aggressive services, are tough, and can provide value to operators. Experience: GPI has been designing and manufacturing fiberglass tanks and custom components for over 50 years. Our engineers have decades of experience specific to the composites industry and tank design and fabrication. Also, our experienced and dedicated craftsmen take pride in each vessel GPI manufactures. As a family owned and operated corporation, GPI Has a horizontal structure, which means that our sales, design, engineering and manufacturing teams work hand-in-hand on every project ensuring that each customer receives the best product possible. When you call GPI, you will get the attention you deserve. Design: GPI specializes in designing and manufacturing complex and large vessels, including the capacity to build 17’ diameter tanks in-house (and larger sectional vessels). 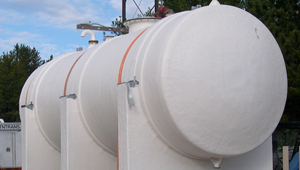 We also specialize in manufacturing double-walled tanks, insulated and heat-traced tanks and dual-laminate vessels. 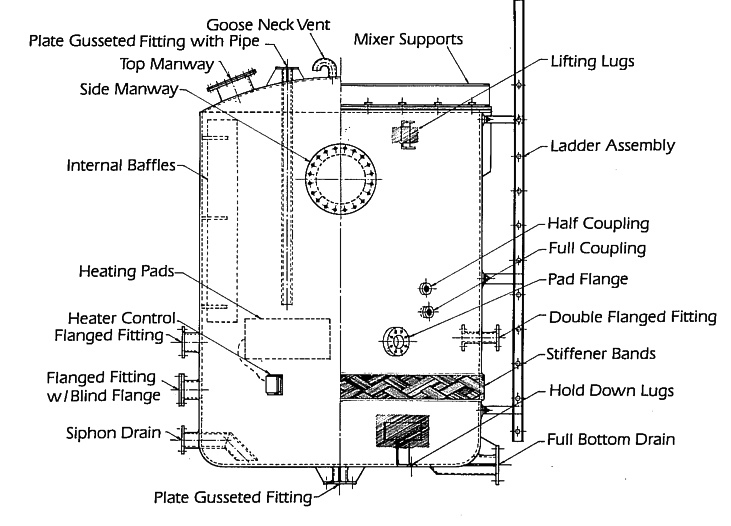 GPI has developed a proprietary technique to manufacture double-walled tanks (a tank within a tank). 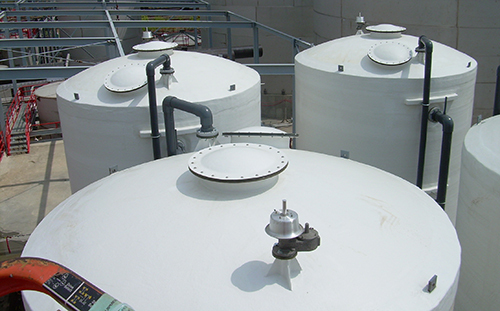 Double-walled tanks often will reduce the requirements for external containment, which can significantly reduce the overall cost of projects. We can also install mixers, platforms, ladders and cages, site-gauges, and interior components to our vessels. All of our tanks are designed according to the highest industry standards, including ASTM 3299 and RTP-1. Manufacturing: A benefit of a GPI tank is that all of our vessels have a unitized construction, which means that the tank bottom and side-sheet are constructed as a single piece. This provides both superior corrosion resistance as well as structural benefits. The more you can reduce altering the finish of an interior tank wall, the more resistant to corrosion it will be. Also, by having a unitized construction, there isn’t a bond at one of the most mechanically stressed areas of the tank. All of our tanks are designed for site-specific wind-load and seismic factors. Our heavy-duty hold down lugs, which are fabricated within the structural wall, allow the vessel to be securely fasted to the tank pad. We have 4 CNC filament winders which allow for precise material application in either a helical or chop/hoop pattern and reduce lead times. Depending on your site requirements and service environment, you can choose from a variety of tank configurations, including: vertical, horizontal, rectangular, underground and sectional. A standard vertical tank is equipped with lifting lugs and hold-down lugs for transportation and securing the vessel on-site. Alternatively, vertical tanks can be equipped with mild steel or stainless steel legs or a skirt. 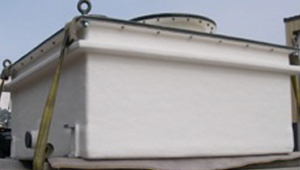 Horizontal tanks are typically fitted with fiberglass saddles, which are bonded to the vessel. Our design team can help you with any questions about which tank configuration is appropriate for your project. 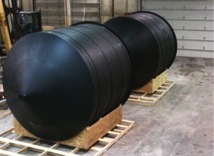 A strong design advantage of fiberglass tanks is that they can accommodate a wide variety of design options. Each vessel is designed with a specific material matrix and resin. Material matrixes (the combination of two or more kinds of fiberglass material) are designed for the mechanical stresses of the vessel. Resin choice is determined by the service application of the vessel. GPI works closely with resin manufacturers to ensure the appropriate resin choice for each product. Also, we can manufacture with resins that can withstand high temperature applications, FDA approved resins and resins that allow for applications with high abrasion. 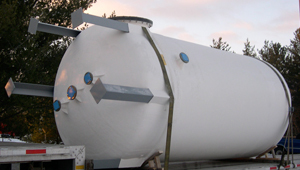 We also manufacture vessels that are double-walled, heat-traced or insulated. GPI has developed a proprietary technique to manufacture double-walled tanks (a tank within a tank). Double-walled tanks often will reduce the requirements for external containment, which can significantly reduce the overall cost of projects. Finally, our tanks can be manufactured with a number of top and bottom configurations, including: dome bottom, flat bottom cone bottom, internal slope bottom, external slope bottom, dome top and flat top. GPI can install an almost endless array of tank accessories to your vessel, including: manways, fittings, nozzles, gauges, baffles, heat pads, gussets, vents, mixers, mixer brackets, site strips, site gauges, ladders, cages, platforms, and a variety of internal components. All of our fittings are located using lasers to ensure proper orientation on the vessel. We also ensure that each accessory is properly laminated into the vessel structure. If a ladder, cage or platform is required, we will pre-fit all items and disassemble for shipping. This ensures for seamless assembly on-site. For some services fiberglass is not appropriate material choice. When you need a storage solution for highly aggressive product, but would like the strength and durability of fiberglass, dual-laminate construction is an appealing option. We can construct fiberglass exteriors around a number of different core materials, such as: PVC, CPVC, PVDF, Polyproplyne, High Density Polyproplyne, Halar, and others. Dual-laminate construction combines superior corrosion resistance with the robustness of fiberglass at a fraction of the cost of many alternative material choices.